The crossover nobody asked for is totally real, and you'll be able to play it on August 29th. 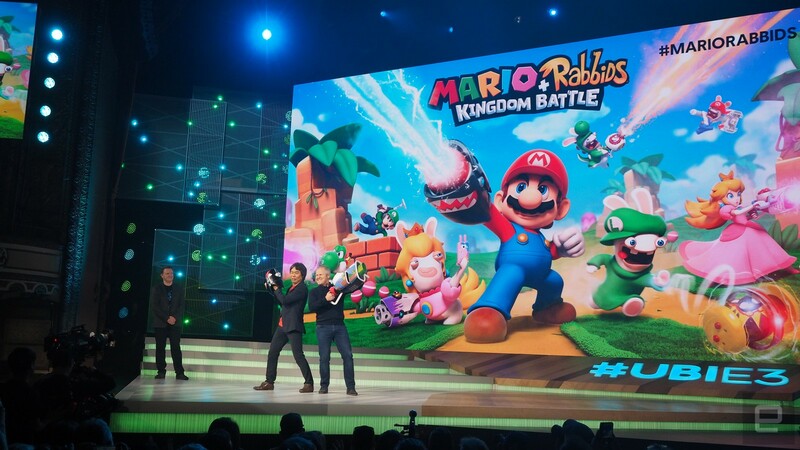 Without a doubt, the strangest Nintendo Switch rumor to surface in recent months revolved around a crossover between Super Mario characters and Ubisoft's screaming Rabbids mascots. It was doubted, argued over and eventually, all but confirmed by leaked game art. Let this be the final word: Mario + Rabbids Kingdom Battle is very real. Ubisoft just announced it at E3 2017. The game looks exactly as strange as the rumors suggested. It's a turn based RPG starring Mario, Luigi, Peach and Yoshi as well as four Rabbids dressed up as Nintendo's iconic characters. Weirder still? The Japanese company's family-friendly cast of characters are all equipped with guns. Extremely silly guns, with lasers, but projectile weaponry all the same. The game is turn-based, but it's more of a tactical RPG than a Paper Mario-alike. Think of it as a Nintendo-friendly version of XCom: Enemy Unknown -- Mario and Rabbid characters alike take turns on small battlefields where they take cover, launch tactical attacks, and equip different weapons to roue the enemy and climb skill trees. All of this is wrapped up in a bizarre, but kind of adorable mix of both franchises' humor: the slapstick, absurdist antics of the Rabbids with Mario's squeaky-clean good nature. It also looks like the game is going to have plenty of references too -- including making Luigi's primary weapon a vacuum cleaner. That's kind of perfect. Mario + Rabbids Kingdom Battle is set to launch on Nintendo Switch later this summer -- August 29th, to be exact.